Our Metal Braided PTFE Hose offers the flexibility of our standard metal hose, with the added benefit of excellent chemical handling ability of PTFE, along with higher than usual pressure capabilities for PTFE due to the outer stainless steel braid layers. This hose can be a product used virtually in any application from basic water service, to the most extreme chemical handling service situations. 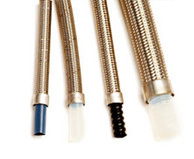 For aggressive chemical application, food handling, and improved overall internal flow characteristics, the PTFE lined metal braided hose is the solution.